As a therapist and teacher of psychology, I spent most of my adult life listening to the stories of individuals free falling from the summit of love, crashing down into the relational desert of mourning and heartbreak, bewildered by the fact that a heartbreak transforms an otherwise functional adult into a cognitive dimwit. This book explores how love is at the core of every therapeutic approach, and how both its bitterness and sweetness are fundamentally factors of evolution and liberation. Yet, love is also easily corrupted, which explains why none of the usual admonitions to let go, and none of the popular theories based on stages of mourning have succeeded in providing healing. Neuroscience demonstrates what happens in the brain to explain the misery and medical risks of heartbreak, but it is psychology which has the tools to force the brain to evolve. 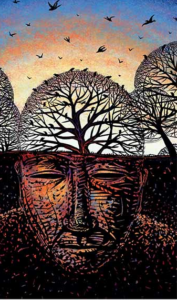 It is the first time, in the history of psychology, that some of its basic assumptions about the unconscious aspects of the psyche are confirmed by neuroscience, pointing at what works and what doesn’t. New evidence demonstrates how a traumatic experience (such as the rejection from a partner, the mourning of a child, a family feud, a loss of professional or national identity) cannot be erased from the folds of our brain, which explains how it does not work to try to forget the relationship, its beauty, or its pain. The brain can only add new aptitudes to the repertoire of responses, and these new responses, over time, will over-ride the earlier ones. This book reviews those new aptitudes that bring healing and evolution. The pain of heartbreak and mourning is truly a push from nature, to propel all of us beyond our contemporary dysfunctional myths about love, freedom and relationships. No one volunteers for a devastating heartbreak, yet, it happens! Those who succeed in liberating their captive heart gain an advantage over others, because they learn, at great cost, what supports love and what doesn’t. The pain of mourning and heartbreak is neurologically similar to being submitted to torture. There seems to be only one way to end that agony and to limit somatic damage; neurobiology calls it an evolutionary jump and psychologists call it an increase in consciousness. Past theories of grief therapy considered recovery from the point of view of stages: a one-year cycle of mourning was supposed to heal the heart. Not so! A true Liberation of the Heart is a process of neurogenesis as well as a process of individuation, which means that the whole brain must re-configure its connections and its thinking about love and relationships. The good news is this: if you love, your heart should be broken at some point or other in your life. If not, your love may remain the innocent love of a child. This book explains what you need to understand in order to avoid victimization from the traumatic aspects of heartbreak and mourning. A wider definition of love and a deeper understanding of its psychology will free you of the obsession for the missing partner and will teach your heart to love in a wiser manner.